If you’re looking for a grain-free alternative to traditional pizza crust, we’ve got the golden ticket. 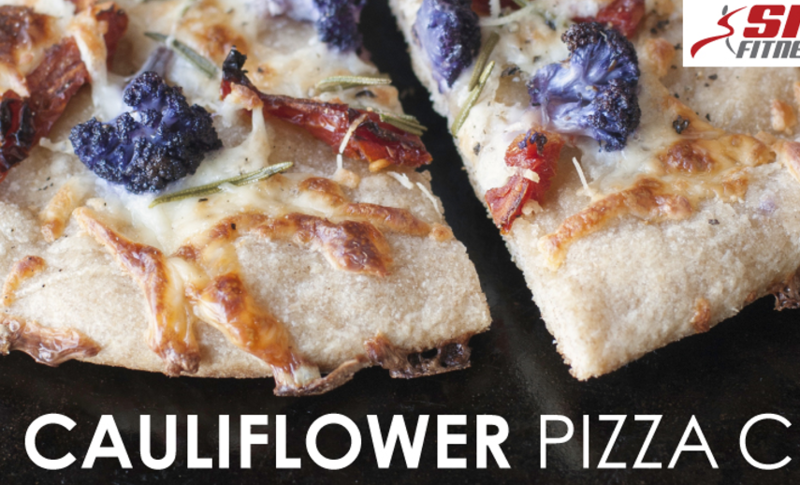 Let’s talk cauliflower crust! Not only is it easy to make, but the end result is a gooey texture with crisp edges that will blow you away. If you’re not a huge cauliflower fan, please don’t write this recipe off just yet. Oddly enough, the crust doesn’t taste like cauliflower at all. Add your favorite toppings and you’ll be pleasantly surprised. We guarantee you won’t be able to eat just once piece. Preheat oven to 450ºF. On a cutting board, place a large piece of parchment paper and spray it with nonstick cooking oil or coconut oil. Wash and thoroughly dry a small head of cauliflower. Cut off the florets—you don’t need much stem, just stick with the florets. Pulse florets in a food processor for about 30 seconds until it has a snow-like consistency. You should end up with two to three cups of cauliflower. Place the cauliflower in a microwave safe bowl and cover. Cook for four minutes. Dump cooked cauliflower onto a clean towel and let cool. Once the cauliflower is cool enough to handle, wrap it up in the dish towel squeeze out as much water as possible. This will help you get a chewy pizza crust, which is the consistency you want. Dump squeezed cauliflower into a bowl. Add parmesan cheese, mozzarella cheese, salt, dried basil, dried oregano, and garlic powder. Lastly, add the egg and mix. Feel free to add a dash of cornmeal if the consistency is watery. This will allow the mixture to thicken. Once mixed together, use your hands to form the dough into a crust on your oiled parchment paper. Pat it the cauliflower ball down thoroughly; make sure it is spread evenly on the parchment paper. Next step, baking time! Slide the parchment paper onto a baking sheet and place in the oven. Bake for 8-11 minutes, until it starts to turn golden brown. Remove from oven to cool. Finally, it’s toppings time! Add however much sauce, cheese, and other goodies you want. Slide parchment with topped pizza back in the hot oven and cook for another five to seven minutes until the cheese is melted, bubbly, and slightly golden.